You’ve finally bought your first solid top or all-wood acoustic guitar. The hard part is done – or is it? We’re sure it cost a pretty penny to buy a guitar with true tonewoods, an upgrade from laminate, but you’re going to have to spend a little more to protect your investment. With a cherished prize comes responsibility. What you need is humidity. Here, you’ll find out what you need to do to keep dry air from sucking the life and moisture out of your precious instrument. Have you never thought about that before? It’s time for a rude awakening! If you live in dry climates, you’ll know all too well what happens to your body when there’s not enough moisture in the air. Chapped lips, dry skin, and even a headache and nosebleeds can occur. While your guitar may not bleed at the pores, it’s still vulnerable to drying out. Naturally, wood will retain a certain level of moisture to protect itself and sound great. But, since it’s now a guitar and not rooted in the ground, you’re going to have to supply that source of moisture. During its six month cleaning, you’re likely applying some conditioner and/or oil (right?) to help hydrate and protect it. But, during those six months of storage, being hauled across state, and dragged from gig to gig at the beach or campfires, it’s going through a lot of change and exposure to accidental abuse and environmental damage. To help your guitar look, sound, and play its best and to extend its longevity, you’ll need to control humidity levels or provide some. All guitars should have some form of humidification. Some laminate guitars come with solid tops, and those will need protection too. Interestingly, vintage guitars may have the upper hand by being lower maintenance than newer ones. Vintage guitars were often dried-out naturally over a period of maybe a decade before they were made into guitars and therefore are more stable in nature. They’re less prone to warping and cracking, and can retain moisture a lot better than newer gits. Newer guitars go through a process of being kiln-dried. This is an artificial process of speeding up the drying stage. Because of this, they’re more susceptible to warping and cracking, and require a lot more moisture for optimal guitar health versus their vintage counterparts. Humans can judge the effects on their bodies when it’s too dry or when they’re sweating bullets due to the weather. But, if you can’t quite judge what’s acceptable and what’s threatening for your guitar, your best bet is to keep a hygrometer with your instrument. You will need a digital hygrometer. A hygrometer measures the amount of moisture/water vapor in the air. Checking on this regularly can help you determine if your guitar is living in an acceptable environment. The ideal humidity for an acoustic guitar is 45-55% with 40-60% being somewhat acceptable. Place the hygrometer in the open part of the case to correctly determine the moisture levels the guitar is actually exposed to. Avoid storing it in the closed compartment of the case. Inside the house, you’re probably lacking some much-needed moisture. Now that you can track humidity levels, it’s time to do something about it. Controlling humidity in a small place is much easier than an entire room. This is a great excuse to keep your guitar in its hardshell case. There are many types of guitar humidifiers in the market. Some are relatively cheap, and others will be more expensive. With either option, think of it as a budget but highly effective insurance policy and prevention method against very expensive repairs. If you have multiple guitars in one room, you most likely have them on display. While we talk about this more in the next section, we’ll provide you with a humidifier option for this scenario right here. A room humidifier would be the first option. Be very picky about which one you choose since they can all vary in shape, size, and technology. Programmable ones are very convenient, and they often have a built-in hygrometer, ultrasonic technology, and warm mist to get the job done. Another type of guitar humidifier can be suspended between the strings. It comes with a sponge-end that you damp every few days to provide moisture. However, hydration levels will be high when you’ve first wet the end, but it will drop as the sponge-end dries up. One of the best forms of guitar humidifiers has a double-role function. The technology behind this particular humidifier was originally designed for humidors (think cigars), so it wasn’t long before it was modified for guitar use. It has a gel that provides both moisture emittance and moisture absorption if humidity levels get too high. It’s a win-win. Some guitarists have even said that a dried-out guitar that’s ‘developed’ and matured over the years sounds better. If it’s dried-out, it’s prone to cracking and warping – and you can expect a hefty bill to repair your guitar. The maturity that we often talk about is when the guitar is played and cared for overtime allowing tonewoods to naturally age and develop to enhance your music signature – not ruin it. If you have a show room where you like to keep your guitars on display on stands or wall-mounts, you’ll need to provide humidification and consistent temperature control for the entire room. It’s much harder said than done because the guitars are exposed to other abuses. 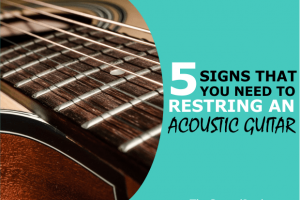 Guitars on the wall are susceptible to contracting and expanding with room temperature that obviously will harm your guitar with cracks, playability issues, and joints failing. The backs of the guitars will acclimate to wall temp, and the soundboards will acclimate to room temp. Guitars on stands are susceptible to accidental tumbles, and the effects of room temperature changes during Winter months due to heating ventilation, fireplaces, etc. can be damaging. The best place to control humidity is in a small place – keep your guitar in a hardshell case for the best protection. Sometimes though, there is too much of a good thing. There are damaging effects that can happen to your guitar if there’s too much moisture in the air. This can particularly be a problem for different regions during the Summer. You’ll need to keep an eye on humidity levels to control them. Here’s the damage if you ignore it. Give Your Guitar the Care it Deserves! Don’t forget common sense guitar protection. Don’t leave your guitar in the trunk of a hot car unless you want a pile of firewood. Don’t expose your guitar to extreme cold and then right into a warm environment unless finishes with checking marks appeals to you. Always let the case warm to room temp first before pulling out the guitar. It’s not the end of the world if you start seeing small signs of damage. 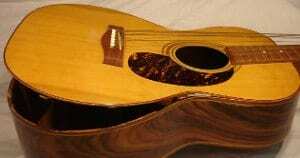 Get your guitar in to a professional repair shop right away to assess the damage. It’s never too late to start proper care and maintenance. Your guitar deserves it!